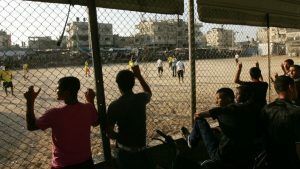 Nine players of a Gaza-based football team have been barred from traveling out of Gaza to participate in a football match in Israel-occupied West Bank. The players based in Rafah, border town with Egypt, have been prevented from attending the final match of the Palestinian cup against Hebron-based Ahly al-Khalil, on Friday, Middle East Monitor (MEMO) reports citing Abdussalam Haniyye, member of the Palestinian Youth and Sports Supreme Council. Israel has since 2007 imposed a blockade on the enclaved Strip following Hamas’s landslide win of Palestinian elections. Israel controls exit points into Israel and in the West Bank. Haniyye on his facebook page urged the international football governing body, FIFA, to intervene and rein in Israel. Last year’s Palestinian cup final was delayed after six players from a Gaza team were refused permission to travel. The decision was later reversed after a FIFA complaint to Israeli authorities, MEMO notes. Written by: KanelkaTagba on August 3, 2017. Posted by KanelkaTagba on Aug 3 2017. Filed under Headlines, World News. You can follow any responses to this entry through the RSS 2.0. Both comments and pings are currently closed.